Speaking in the House of Commons on Wednesday, Mr Corbyn said: “We have to be clear, Mr Speaker, that intimidation is wrong outside this building as it is in any other aspect of life in this country. Prime Minister Theresa May agreed with the Labour leader that there was “no place for intimidation” in British society. She added: “Politicians do need to be able to have a safe space in which to express their opinions, many of which are passionately held. In a public meeting in 2014, Labour’s John McDonnell quoted someone saying they wanted to “lynch” the Conservative MP Esther McVey. Conservative MP Anna Soubry being confronted by protesters outside of Parliament. Image: Femi Oluwole/Twitter. Mrs May added that she condemned the threats towards Soubry, which took place on Monday. 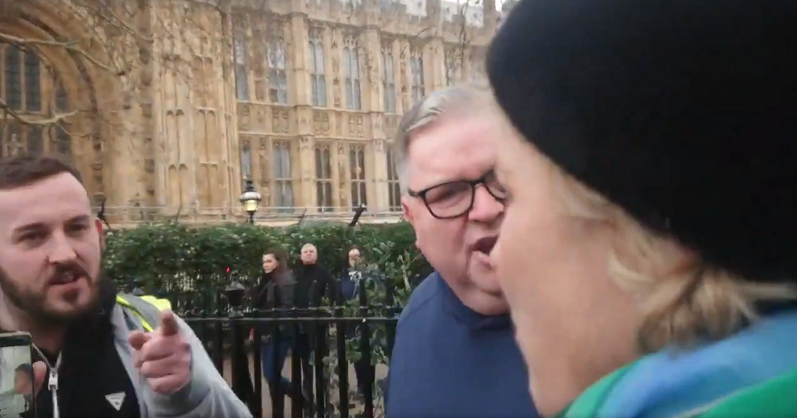 The protesters, some of which were wearing yellow vests, were filmed confronting Soubry calling her a "Nazi" and a "fascist". The Prime Minister said: “In recent days, we have seen instances of threats of violence or intimidation against members of this house including, my right honourable friend, the member for Broxtowe and members of the media. The Metropolitan Police confirmed on Tuesday that it had opened an investigation into whether any offences had been committed by the protesters, following pressure from Parliamentarians urging the police to do more to protect MPs. The MP previously said her office received a number of death threats in 2017 following a newspaper frontpage that named her as one of the 15 "Brexit mutineers". Conservative MP Nicky Morgan has said many MPs had increased their security due to the Brexit debate. The MP for Loughborough told talkRADIO’s Julia Hartley-Brewer: “Many, many MPs have had to put in security measures over the last couple of years because of this Brexit debate. “There’ve been protests in Westminster for a few years but they’ve been respectful and good-natured, and this week it tipped over into something else. Conservative MP Jacob Rees-Mogg has defended the protesters' rights to free speech, but said it was wrong that Soubry felt “intimidated”. The MP told Hartley-Brewer: “The right of free speech is an important one, and I think people are entitled not only to disagree with me but to tell me they disagree with me. That is a right that should be protected. “Politicians shouldn’t be cut off from the rest of the world. On the other hand Anna Soubry said she felt intimidated, and it quite wrong that people going into their place of work should feel intimidated as they do so.